Born in Orange, NJ, Roy Scheider was an amateur boxer, before turning to acting. He rose to fame as Captain Martin Brody in Jaws. His Celebrity Jersey Card comes from his role in Tiger Town, the first television film produced for the Disney Channel. 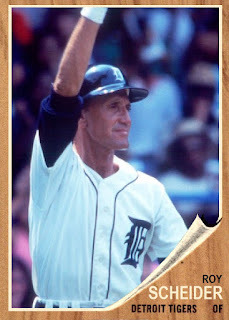 It featured Scheider as an aging member of the Detroit Tigers. Ironically, Scheider also appeared in Paper Lion, but in an uncredited role. Could there be a Celebrity Jersey Card of Scheider as a Lion?